Makes a great gift for the New Vehicle Buyer. 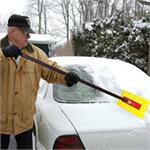 The SNO BRuM offers consumers a way to quickly sweep snow off a vehicle and away from the user. Perfect for sport utility vehicles and minivans where reaching across the width of the vehicle with a typical snow brush is often not possible. With the SNO BRuM, drivers can easily push even heavy, wet snow off the roof, hood and trunk without scratching the paint or harming the finish of any vehicle. The durable molded polyethylene foam head has been lab-tested for non-abrasiveness, freeze resistance and center load stress and durability and has achieved the highest ratings in all tests. The oversized head (6' x 17") is the largest snow remover available. The high-impact plastic face plate is recessed into the foam to prevent contact with the vehicle. The aluminum telescoping handle has special cold resistant nylon threads and extends from 27" to 46". The SNO BRuM can be used to: remove snow from vehicles, remove snow from awnings, remove snow from pool covers. 12-PACK RETAIL PACKAGING Allows display in your Showroom, Parts, or Service Area. $175.00 per 12-Pack plus shipping and tax.